I think by now I have made it quite clear that I’m really not the greatest baker, but I still try my damnest to perfect my baking skills. My sister lovingly told me over Christmas, ‘Your baking has really improved, you’re getting better… though it has taken you quite a few years’. She speaks the truth and I hold my hands up and admit I am not the first person you would call upon to bake for you. Ha ha! Some of my baked goods, like my rum cake, have tasted beyond fantastic! Then there are the many baked goods that fall under the list of huge massive failures, or what I should really say is that they are still in the (far off) development stage! I was on this baking high over the Christmas period with this new found baking confidence. I made a venison pie, a rum and almond cake, sausage rolls and a pear and almond cake. The venison pie and sausage rolls were both big and bold in flavour but I still need to tweak them and work on the pastry for both before I can share the recipes. They really are in the development stage. Filled with confidence I moved onto making the pear and almond cake for my niece and nephew. This turned out to be a COMPLETE FLOP. Literally it was floppy. We all know cakes are meant to have a little spring and bounce to them and not flop. So let’s just say that the pear and almond cake is (way off) being developed! Luckily, my 3 year old nephew and my 6 year old niece were more than happy with a hot chocolate sauce and fruit. I didn’t mention the cake. This slight blip in mastering my baking skills did not deter me; I just decided to move from baking cakes to bread and nailed it! I claim to not really eat bread but practically eat it every other day! So now my new and latest line is that I now only eat it on special occasions. So keeping true to my new line, I made this focaccia bread for a party on New Year’s Eve and will be making it for a lunch I am catering for in a couple of weeks….oh, and I made it this weekend – you’ve got to taste and trial things a few times just to make sure they are good! 1/2 pomegranate, removed from the skin. (Tip: lightly bash it with a rolling pin before you cut it into it and then squeeze it as you would do with a lemon or lime). Put the flour and salt into a mixing bowl and make a well in the middle. In a separate bowl mix together the yeast, sugar and water with a fork. When the mixture begins to bubble slowly begin to add it to the flour and sugar and mix together with a fork. Once mixture has formed a dough, knead it into a ball. Lightly oil a bowl, place the dough in it and cover with a tea towel. Place in a warm place i.e the cupboard with your boiler for 30 minutes. While the dough is rising, place a small frying pan onto a medium heat and pour in the olive oil. 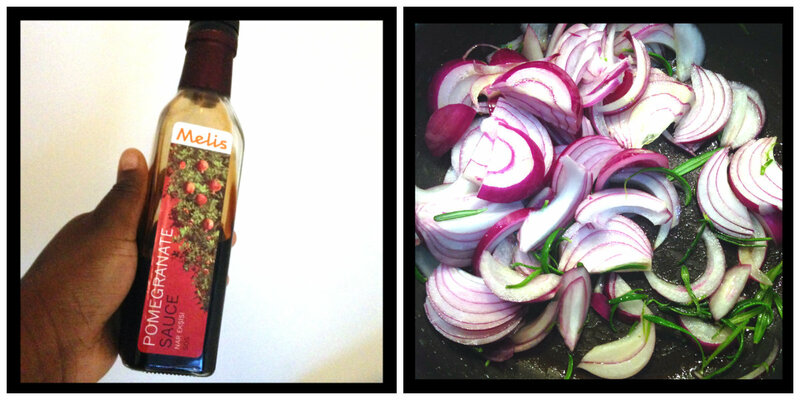 Once the oil is hot, add the red onions and rosemary. Turn down the heat so that you allow the onions to soften and sweat, and not fry and become crispy. 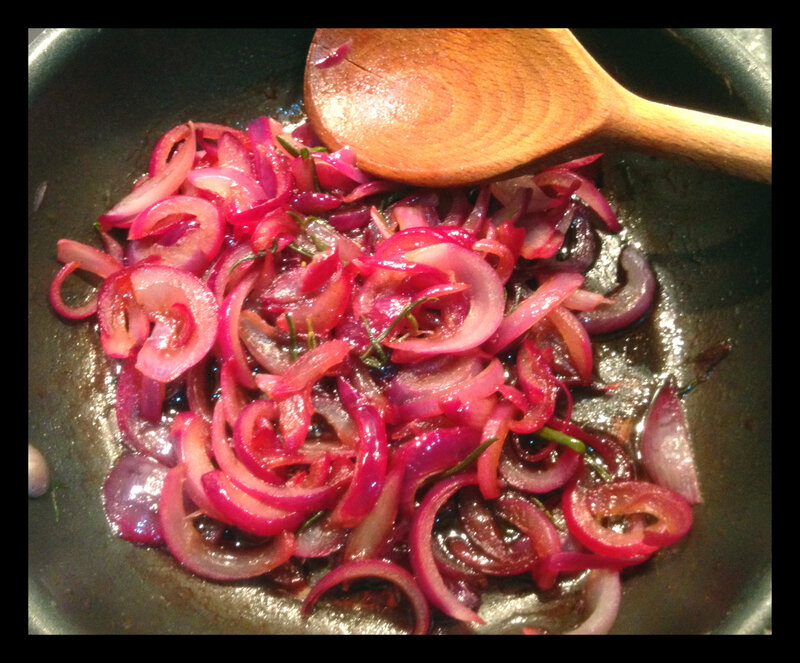 Once the onions begin to soften, add the pomegranate syrup. Cover with a lid for about 3 – 4 minutes so that the onions and rosemary absorb the liquid. After 30 minutes remove the dough from the warm area and place straight onto the baking tray. 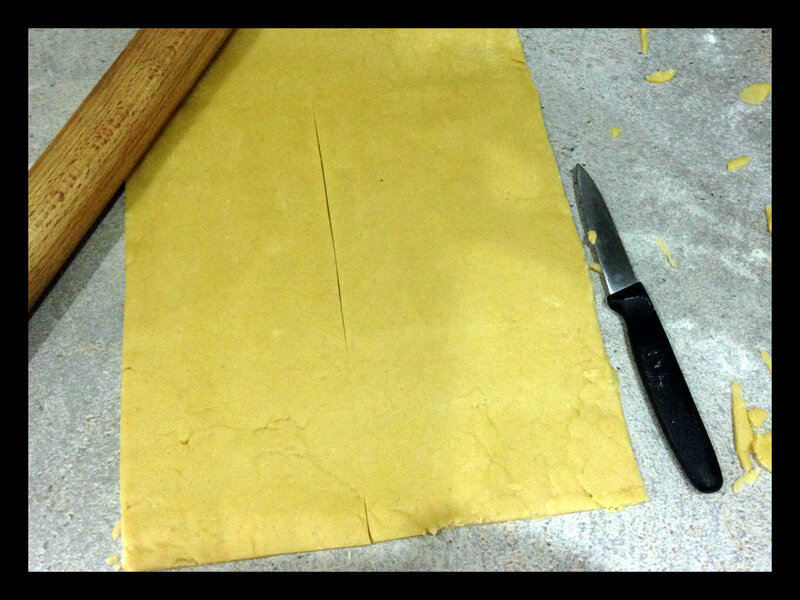 Now stretch out the dough into a rectangular shape measuring about 30cm x 15cm. 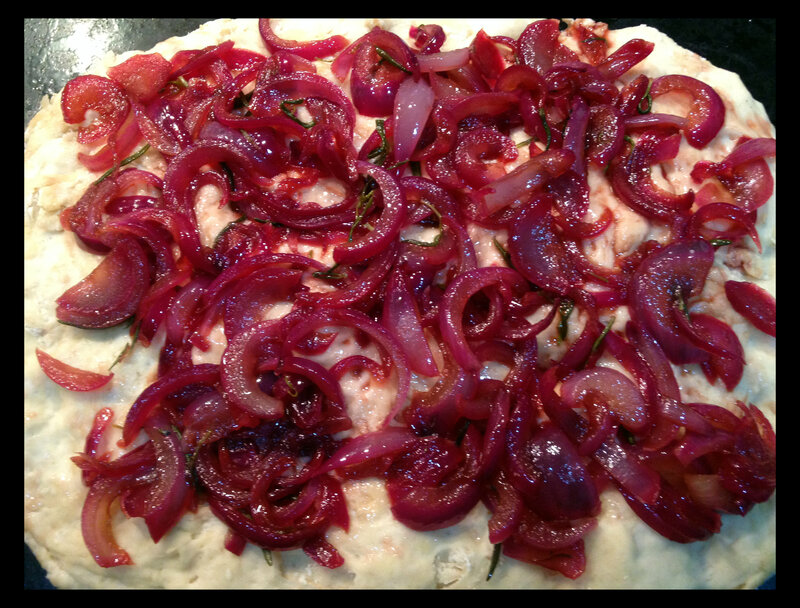 Prod the dough a little to make wells and then sprinkle over the red onions and rosemary. 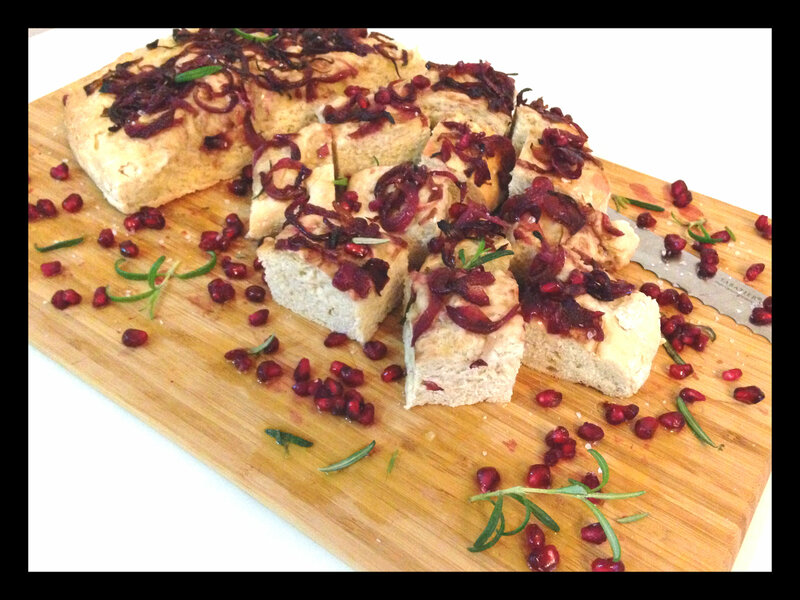 Decorate with the fresh pomegranate, a little rock salt and a drizzle of olive oil.